Because Shanna Said So...: Where did you get that dress? My friend Joy agreed to let me feature her dress (here) on blog today. When she walked into the restaurant for our ladies night last week the first thing I said was, "Where did you get that dress?" She scooped it up from a website that I have never heard about before. This online store might be old news to you, but for some odd reason, this is the first I have heard about it. It is called Alloy. They have some of the most "FAB-YUH-LUHS" finds and all are offered at super affordable prices. You can peruse through the site by different trends, outfits, best sellers, new arrivals and they even have extended sizes. There is most definitely something for ever lady out there. I immediately fell in love with way too many things and I haven't even had the chance to browse through the whole site yet. So, if this is big news to you as well, make sure you go check out Alloy.com as soon as you are done reading. I have a strong, gut feeling that you too will be adding some items to your cart in the near future. I told you! Pretty darn spectacular, right? So, off you go now...shop away! I am also guest posting for Stesha today at Classic and Bubbly. I am gabbing about five summer must haves. And if you don't know this beautiful, ball full of talent, let me introduce you! She is one of my closest lady friends in blog land. She has crazy skills behind the lens, is absolutely gorgeous and a free spirit with a heart of gold! Go check her (and me) out! maxi and the polka dot top you pictured. Need to check this site out! Hope you had a great weekend! I love Ally! There are def some great finds there!!! You just have to be careful & read the reviews if there are any because sometimes the sizing runs very off. I love a lot of the maxi's! Polka dot frenzy!!!! Love it! This could be bad........so much time on my hands.......to browse this site. Oh my gosh. Give me all of the polka dots!! I'll have to check out this site ASAP. Love Joy's dress as well! The color is beautiful. Your friend looks really pretty in that cobalt dress! I've ordered from Alloy before. I think they cater towards teens but their prices are very affordable. Your friend looks amazing in that dress! I love the bold color! What a pretty dress, such a great color! I've never heard of this site either so thanks for the tip! Thats awesome she let you feature her dress it's really pretty! I have heard of Alloy but haven't shopped their in a long time I used to get their catalogs in the mail before I moved. The color of your dress is gorgeous! I can imagine how striking it is in real life! Love your other choices as well especially the first dress, beautiful! Love that cobalt dress - looks amazing on her! I am definitely trying Alloy - thanks for the tip lady! Whoa holy cuteness! Going to check out their site now! LOVE that color! Great dress... and, so funny you said that because I actually heard someone talk about Alloy the other day, and I JUST was browsing there this weekend. I loooove the polka dot dress and shirt you showed! 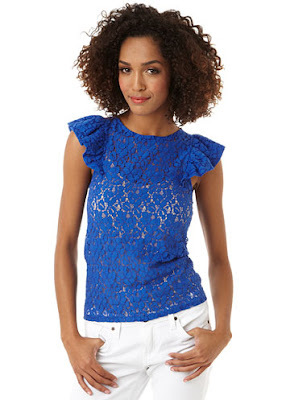 The blue lace top is gorgeous too. Your friend looks so cute! I think I used to get Alloy catalogs but haven't gotten any in years. So glad I found out about this shop!!!!!!!! Love that blue dress. What an adorable shop! I'll have to check them out! that dress is awesome! i love it on her. and her headband too that is super super cute! The dress is TDF! Love the color! Must check out Alloy. Thanks for the tip. Hope you had a fabulous weekend. I used to check out Alloy, but haven't in ages... I don't know why I stopped because that polka-dot blouse is fabulous! Thanks for the heads up lady! Love the dress... your friend is adorable too!! From your Instagram's this weekend, it looks like it was a successful lake trip :) Hope you have a wonderful week, Shanna! Love that dress and that website looks dangerous for my credit card!! Hope you had a great Monday! Love the dress. The color of blue looks gorgeous on you!